A bachelor’s degree is a four-year degree. It typically takes four years of full-time study to earn a bachelor’s degree. In these four years, you will complete 120 semester credits or about 40 college courses. In most cases, more than half of a bachelor’s degree consists of general education or liberal arts courses in areas such as English, Science, History and Math. Typically only 30 to 36 credits—10 to 12 courses—will be in your major area of study. 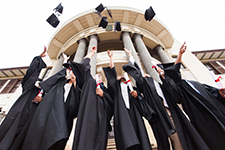 Historically, the term “college degree” meant a bachelor’s or traditional four-year degree. The bachelor’s degree remains the standard for entry into many professional careers. Know that a graduate or professional degree will be required for your career. Have already earned more than 60 semester college credits or hold at least one associate’s degree. Have formal and informal learning experiences gained from professional work experiences, military service, training classes, professional skills workshops or seminars. These experiences may translate into college credit which means you finish faster! Some careers may require a very specific type of bachelor’s degree. For example, if your goal is to become a public school teacher your state Board of Education will require, at minimum, a bachelor’s degree in education —and that degree will need to include some very specific courses. Check with your state licensing board before enrolling in any bachelor’s degree program in accounting, education, nursing, counseling and engineering, in particular.